I am knee-deep in planning ahead for next year right now! For the 2017-2018 school year, my children will be in grades 7 and 5. Yikes. High school is also looming over my head a bit, so I’ve been keeping my eyes and ears open for good options for those years. I’d really like to get my kids some interaction with native French speakers on a consistent basis to improve their language abilities, so I’ve been looking for some options to accomplish that goal. Today, I’m sharing my research with you. 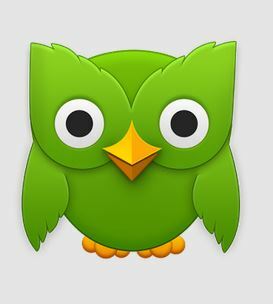 Duolingo is a great option for middle and high school as it moves fairly quickly. It’s engaging and I really like how it progresses. I’ve actually been using it myself to learn Spanish (it offers multiple languages). I’ve been working on it for 5-25 minutes a day for the past 2ish months or so, and apparently (according to the app), I’m 11% fluent in Spanish (yay for me!). I have trouble dragging myself out of bed in the morning, so instead of scrolling on Facebook, I open Duolingo for a few minutes before I get up. Your middle-schoolers and high-schoolers will likely enjoy this app and learn a lot from it too. Best part is that it’s completely free. Give it a whirl and if your student doesn’t like it, he/she can just stop and you can move on to something else. I have not used this program so I can’t say one way or the other whether it’s any good. I only know that a lot of people I know have used it in the past. You can find it here. This is where I found it the hardest to find resources. When your students have passed all the introductions and basics, the number of choices for study materials drops off dramatically. I muddled my way through this stage with lots of read-alouds, which work great if you’re fluent yourself, but if not, you might want to investigate some online classes. Currclick Live, Bon Voyage France, and EZ-FSL offer different class options. I wish I could give you more info on these, but I haven’t used any of them. If you have, I’d love to hear your feedback! This comprehensive offering from Belgium has lots of different class options offered for grades 1-12 with French as the language as instruction. Note that grade 7 = 1ère secondaire. Tuition costs 25 Euros for course access and teacher interactions for one year. I’m considering having my daughter start one of their courses this summer to try it out – I just wish they would put more information on their site as to what the students will actually do. I’m inclined to start her at a lower level to make sure she can handle it – 25 Euros is a minimal investment so I can definitely afford for it to be too easy or completely wrong for her. Find them here. The Independent Learning Centre (also known as ILC) offers a handful of options per year in French for grades 9-12. Unfortunately, the French language arts options don’t start until grade 11. If you are resident in Ontario, the tuition is $40 per course, and you do need to be registered with the school board to enroll. If you live outside the province, the tuition for a full credit course is $500, or $250 for a half-credit. Find the French courses offered here. This private school in France offers online options from kindergarten through grade 12. Note that in France, they count the school years down instead of up. Grade 6 in Canada/US = 6e in France, but 7th grade here is 5e there. The courses are not cheap, starting at 420 Euros for grade 7 (5e) French for the year. And then there are novels to buy on top of that if you can’t find them at the library. I do like that the courses have so much reading because I think that’s a great way to learn. However, the fact that many of the novels are listed as optional makes me think that they must not actually study them all. I’m considering this for a high school course – I just wish it wasn’t so crazy expensive. Find Hattemer Academy here. A few options for grade 7-8, more for grades 9+. I like that they have courses in other subjects offered with French as the language of instruction, and that they offer French language arts in grade 9 where the ILC noted above starts in grade 11. Some of subjects (like higher level sciences for example) are a little intimidating, even if your students are fluent, BUT there are a few others that I think my kids could manage. Tuition fees are zero (free) if you happen to live in Alberta, but for those of us who don’t, they will run you about $500(CDN) for a full course. The higher level courses (grades 10-12) are actually priced at $100 per credit, but a full course looks like it’s about 5 credits, so it ends up being about the same. Courses that are a lower workload are less expensive. At the time of writing, one Euro = $1.45 CDN. So that means that the distance ed courses offered by Alberta are $109 cheaper than Hattemer Academy. But which one would give more interaction with native speakers? No idea. Check them out here. If you click on the French immersion checkbox, it will narrow down the course offerings to French only. This one offered by an Ontario school board is an online course, but they insist that you go to a school to do it. Talk about ridiculous bureaucratic rules! Formation à distance is for ages 16+ as of June 30th in any given year, so really we’re talking about grade 12 options only. Centre d’apprentissage en ligne – offers grades 10 & 11 only, but at $650 a course, I’m more inclined to go with other options. I don’t want my kids to do all their middle school and high school work online because then we’d be losing one of the huge benefits of schooling at home in the first place – time together being able to discuss life issues together rather than having those discussions with outside teachers. Do you have any resource suggestions for me for middle school and high school? 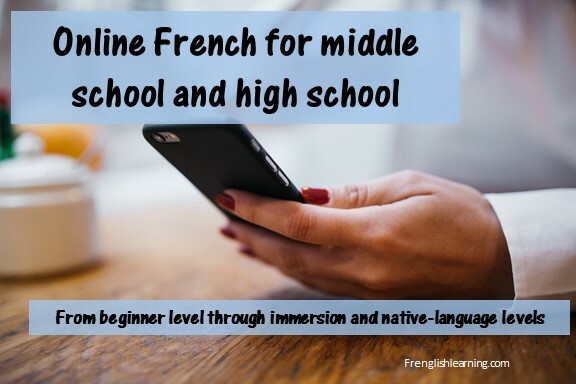 This entry was posted in 11+ years, Advanced, Beginner, Bilingual parent, Curriculum, Immersion, Intermediate, Online classes, Parent speaks no French, Parent speaks some French, Web sites by Leanne. Bookmark the permalink. Hi, my kids are bilingual, Native American and Native French. We live in France. 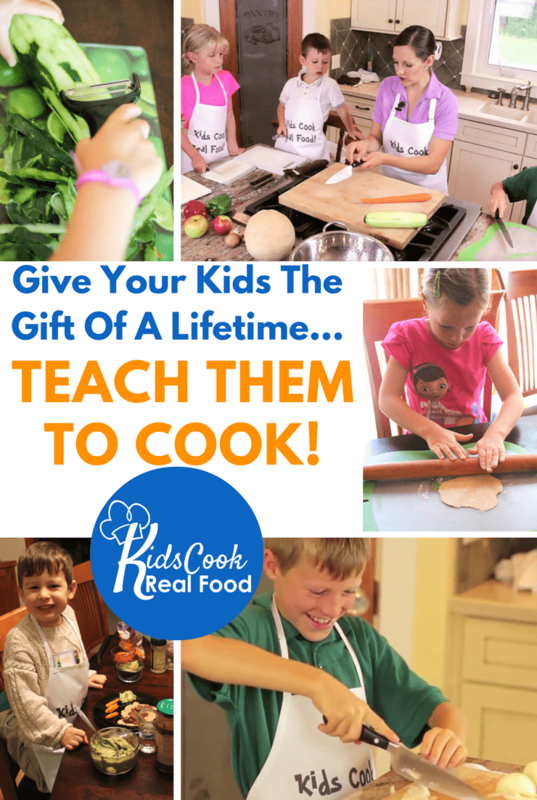 Have you ever considered kids teaching kids? Mine might be interested. We’re looking for options here too. Also, have you ever looked at CNED? Thanks for the comment, Sara. I did look at CNED a long time ago (around grade 1 or so), and it didn’t work very well for us. I should look again, though as things always change! 🙂 Kids teaching kids is also a great idea for practicing conversation! Monarch has an online French course that I found to be very in depth so far. It teaches the history of the language, where in the world it is spoken, and is broken down into small lessons. Setting your dates of when you want to complete the course, it automatically schedules all the lessons evenly across those dates. As the teacher you can print out the pages (as I did) to have in a binder. My oldest is a book person, so prefers to read the lessons herself, where my youngest is audio visual, so she has the program read to her. When you purchase it, you get 18 months to complete it. It also auto-grades everything. We also have the complete Rosetta Stone course. Rosetta Stone teaches more like when you were a child learning to speak. You were just taught the names of things and how to speak in sentences by listening to your parents. Rosetta Stone follows that style. So it can be difficult when it comes to the writing part. My oldest likes to understand “why” something is done a certain way. For example, the program will teach you the words for different items, but not explain if they are masculine or feminine, so when you go to write it out, you may not know to use le or la properly. You just have to learn it and pay close attention to the audio lessons (and pictures that go with them) to remember which is which. It also doesn’t teach the endings of verbs when they go with the different pronouns (Je, Tu, Elle/Il, Nous, Vous, Elle’s/Ils). You just need to watch the words on the screen carefully as it teaches it to you audibly. It is actually very similar to Duolingo in that respect. If you just want to learn to speak, without writing and grammar, Rosetta Stone would be excellent. or if you have a learner that will take notes and study it closely. We have also used the Frenchsmart workbooks. Book 4 and 5 were fun. Book 6 and 7 get into grammar, not previously taught in books 4 and 5, so we didn’t know what to do. Those books are more designed to be extra help for kids that are in school. I am reading through your blog and loving the suggestions. My oldest decided to drop French all together and is doing Latin and Japanese instead. 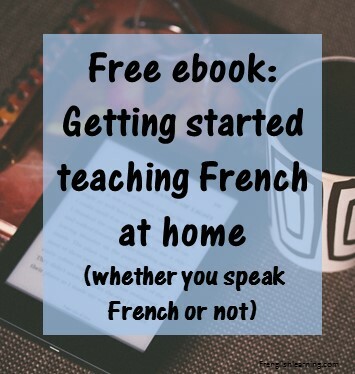 But my youngest loves French, so hoping to use some of your suggestions to mix it up for her.